After the hard week I had had, this movie was exactly the medicine I needed. There is something completely uplifting about animation. I know that not all animation is uplifting, but the animation aimed at the younger audience which is also made so that older audiences can enjoy it. Rest assure, if I have had a hard day at work, you will normally find me at home afterwards watching a movie like “Lilo and Stitch” or “The Princess And The Frog”. Movies like this will also bring a smile to my face. When you are suffering from the stress of the grown up world, what’s better to escape than being entertained by the purity in G rated animation films? The great thing about “Despicable Me” is that before you see the film, you can look at the poster and you have no idea what the movie is about. The promo’s give away nothing about the film which is a great marketing technique. It increases the public’s curiosity of the movie and therefore increases the audience! The most curious part for me before I saw the film was that this film was super successful....and it was an animation purely about a villain! Animation is known for bringing us cute and cuddly characters who overcome the ugly villains, not being purely about an ugly villain! How could something so unattractive be the star of a hit movie? The same thing was thought about “Up” when it was released last year, how could an animated film about an old man and an overweight kid look attractive on the big screen? “Up” was a huge success, and so is “Despicable Me”. There is a lot more cuteness in this film than would be expected. One of the best parts about seeing this film, was when my partner was the only one left laughing in the cinema after everyone had finished laughing at a particular part, because he just couldn’t stop. Priceless. There is nothing despicable about “Despicable Me”. It is one of the funniest animated films to be released in years. Not only is it very funny, but it also extremely clever, original and well written. There are not many film makers who have been brave enough to make an animated film where the lead character is a villain, and an ugly villain at that. However, directors Pierre Coffin and Chris Renaud have done a fine job at turning an ugly character that would usually be disliked into a star. 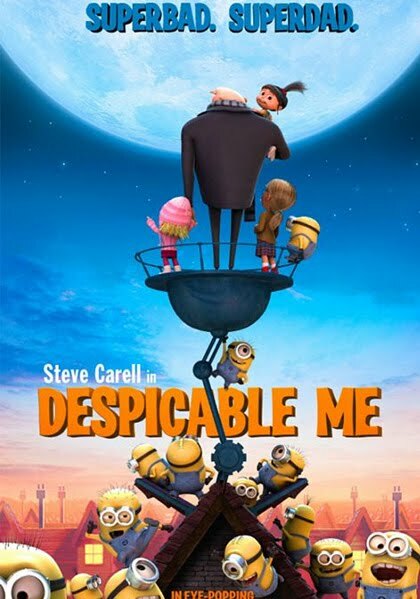 Once best villain in the world, Gru (Steve Carell) knows he is losing his touch after a new villain, Vector (Jason Segel) steals the Egyptian pyramids. Challenged, Gru decides that he is going to aim higher and steal the moon. Of course, a villain must overcome several obstacles in order to get what he really wants. And as one may expect, he is in danger of becoming a good guy in the process. Apart from being just a tad predictable, “Despicable Me” is very well written. The jokes are very clever, but just simple and easy at the same time. The story is also very creative and played out in an interesting way. There is never a dull moment throughout the film and this is one of the few animated films which has been released in 3D and it has been able to enhance the entertainment value. It is definitely worth seeing “Despicable Me” in 3D as the film makers give the audience plenty of surprises and it just adds to the fun of the film. The graphics are fantastic. It is not an overly emotional film, but there are some moments in which will pull at your emotional strings. Even though there are not any cute and cuddly fuzzy creatures such as talking dogs or cats, there are some hilarious characters such a Gru’s yellow minion friends which are definitely worth talking about after the film. It is often hard to critique an actor for a voice part, but credit must definitely be given to the players in this film. Steve Carell, Russell Brand and Kristen Wiig are excellent in their parts. The best part about these actors taking part in “Despicable Me” is that they are not merely just lending their voice, but they are making the characters real. If one did not know which actor was which character, they would have a very hard time figuring out who was who, or they wouldn’t even be able to guess that that actor even had a part in the film. Even Jack McGrayer of “30 Rock” fame has a small part in the film, but it is incredibly hard to pick who he is. “Despicable Me” is the must see animation of the year. It brings a smile to your face and it is incredibly hard not to find this film funny. Great talent went into making every part of this film and it is an absolute winner.